It's always great when a classic meal gets the Johnsonville treatment. 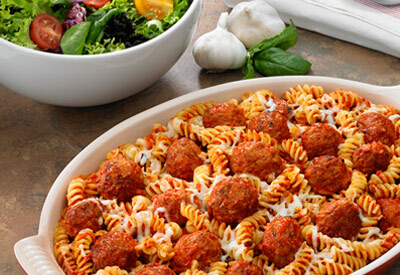 Johnsonville Classic Italian Meatballs bring an excellent blend of herbs and spices for the authentic Italian taste you love, but with the ease and hassle-free experience you need! In a large saucepan, combine the meatballs, marinara sauce and water; bring to a boil. Reduce heat; simmer uncovered for 20 minutes or until meatballs are heated through, stirring occasionally. Transfer to a greased 13 x 9- inch baking dish. Sprinkle with mozzarella and Parmesan cheese.